Donors sometimes say, “my little $25 gift won’t really make a difference.” Tracy would tell you nothing could be farther from the truth. It’s the $25, $50 and $100 gifts that add up to truly impact a patient’s life. 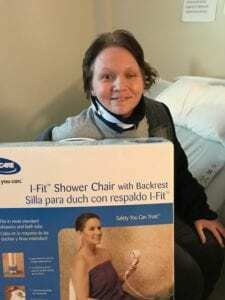 Tracy was in a terrible car accident, thrown from her vehicle and severely injured. At the time of her injury she was between jobs and living with her grandmother. After her release from the hospital a CoxHealth case worker called the CoxHealth Foundation. Tracy needed medications and a transfer chair so she could safely go home and care for herself. The total cost was $169. Not all needs are in the thousands of dollars or even hundreds of dollars. Often the Foundation is asked for $15, $20 and $30 needs. When a patient has already confronted a personal tragedy and have no way to acquire the items necessary to recover, $169 is a huge gift. Tracy will be forever grateful to donors for providing. Today, she is back on her feet and in full recovery. She asked that we share her story as a way of saying thank you for the support she received at a desperate time in her life. All gifts, whether $5 at a time or $125 over a year can give another patient hope and encouragement. Thank you for every gift- they all make a difference.